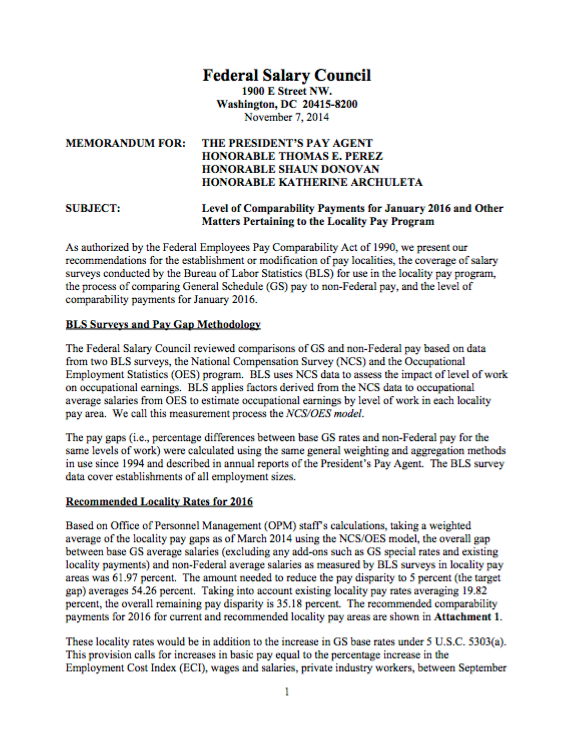 The Federal Salary Council's November 7, 2015 memorandum on the pay gap between GS employees and the private sector. According to an article in Government Executive and covered by NTEU in its e-Bulletin, "Federal employees remain significantly underpaid compared to their private sector counterparts" with "a pay gap between General Schedule employees and private sector workers of 34.92 percent." According to the article, "the pay gap varied by locality" and job series. In San Francisco, for example, which the article noted "already receives the highest locality pay adjustment of 35 percent," "federal workers earn less than half of their private sector counterparts...."
The Article quotes NTEU President Tony Reardon, who said federal employees are "falling further behind the private sector." "Pay freezes and inadequate raises have gone on for too long," he noted, and warned that "unless Congress acts, the federal-private pay gap will continue to grow and the federal government will find it harder and harder to recruit and retain good workers." The study was conducted by The Federal Salary Council, which consists of three experts in labor relations and pay policy and six representatives of Federal labor unions and other employee organizations. You can read the entire Federal Salary Council's November 7 recommendation here.